This package is originally designed for 06 nights/07 days. But we are always happy to cater to our valuable clients’ requirements to embark on a wonderful Sri Lanka food tour combining delicious culinary experience and sights. It can be customised for different durations as per request. Engage in a Seafood Culinary Tour – The tour will commence with breakfast by the pool side with the Executive Chef Priyantha Weerasingha. Colombo City Tour – A drive through the city will take you to the Fort and Pettah- the commercial area of the city and tree-lined Colombo – 07 Cinnamon Gardens. Colombo 3, 4, 5, 8 are the prime residential area of the City. Visit Fort, and Pettah for Shopping. The Hindu Temple at Sea Street, lined with goldsmith’s shops, the Dutch Church at Wolfendaal, dating back to 1749. The historic Davatagaha Mosque, Independence Hall, B.M.I.C.H, they are some of the attractions in Colombo. 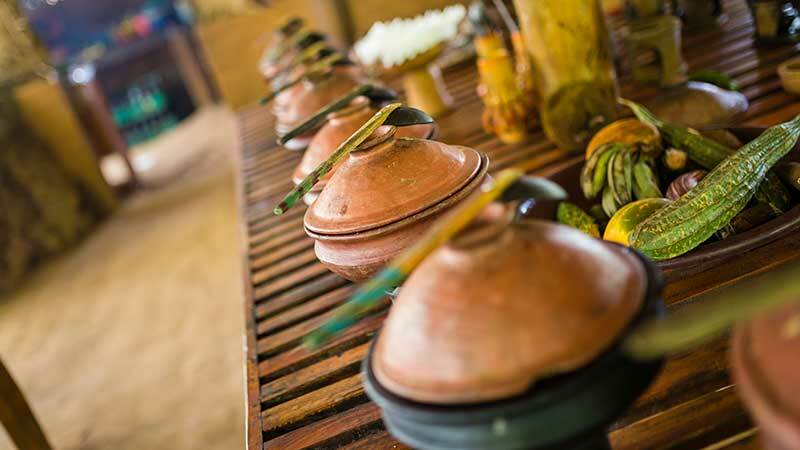 Evening go on an Excursion to engage in a Village Tour to enjoy a Rotti Night of Sri Lanka. This Night you can enjoy a Village walk and engage in culinary activity where you will prepare all Roti types like Pol Roti, Kothu Roti, Kurakan Roti Etc.. Starting at the bustling Galle market, you will meet your host chef who will talk you through the core ingredients of Sri Lankan cuisine such as curry leaves, coconuts, local fruit and veg, pandan leaves and spices. Leaving the market, you will travel in your vehicle to a small rural village located on the banks of the Kapu Ela River for the cooking class. When you arrive you will be greeted with cold towels and a welcome drink and you can make yourself at home inside a rustic wattle and daub mud hut. Here you will learn how to prepare and cook your favorite challenge.